Like the good farmer, he has watched closely the ramifications his work, leaving on it the mark of continuity in treatment by eliminating all the anecdotal and all improvisation. 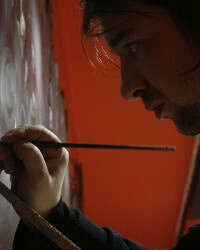 Same as other painters of his generation, who have an especially close relationship with the world in the midst of which they revolve, Mircea Moldovan cultivates first a figurative stile subtilized through styling and decanting, operating on a balance between the reverberations of reality and the need for interpretation, which creates style and individuality. From the serious breath of social aspects, converted into savory impastos of ocher and patinated browns, to the breeze of a nature with fresh chords determined by the specificity of the different seasons, he passes on to a more compressed language, which becomes more elliptic, synoptic through valorizing those aspects of the visible realm surrounded by a halo of a generous force of generalization. A careful look at the painting completed in the last years reveals the passionate exploration of the poetry of simple things, together with the preference for purifying the harmonies in clear luminous tones. We could talk about a real exuberance in the composition of forms and in the interaction of the spots of fresh color, reaching the incandescence of pure tones.